Amish Country, Ohio has no shortage of restaurants to please your palate. When I was growing up, it was hard to find much outside of roast beef & chicken with mashed potatoes- however, Amish Country now offers plenty of unique flavors, plus some old favorites. Walnut Creek’s staple restaurant, Der Dutchman, began in 1969 in an old hardware store. The newer location’s dining room includes a sweeping view over a valley of farmland, making this one of the most nostalgic places to eat in Holmes County. An attached bakery allows visitors to take home the restaurants’ baked goods and assortment of pies. My husband recommends the broasted chicken, while my mother recommends you leave room for the red raspberry cream pie. Der Dutchman is located at 4967 Walnut Street, Walnut Creek, OH 44687. The restaurant is open Monday-Saturday from 7 am- 8 pm. 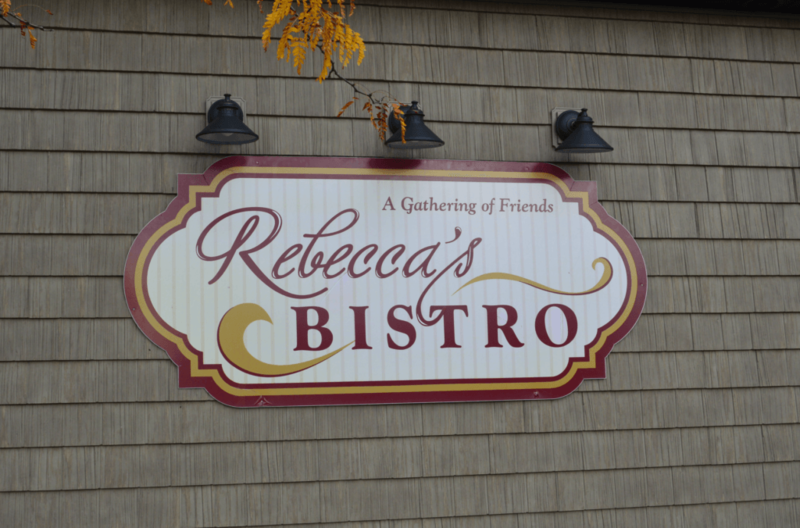 If you’re visiting Amish Country as a tourist, but want to eat where the locals eat, be sure to stop by Rebecca’s Bistro. Rebecca’s is only open for breakfast & lunch. Customers rave about their fresh salads and homemade soups. Outdoor dining is available during the summer, where you’ll watch Amish buggies clip-clop through the busy streets of downtown Walnut Creek. Rebecca’s Bistro is located at 4986 Walnut Street, Walnut Creek, OH. The restaurant is open Monday-Saturday from 8 am – 3 pm. Olde World Bakery and Bistro takes it’s name from it’s approach to baking in an old-fashioned way. Their goods are made without hydrogenated oils, box mixes, or bleached flours. 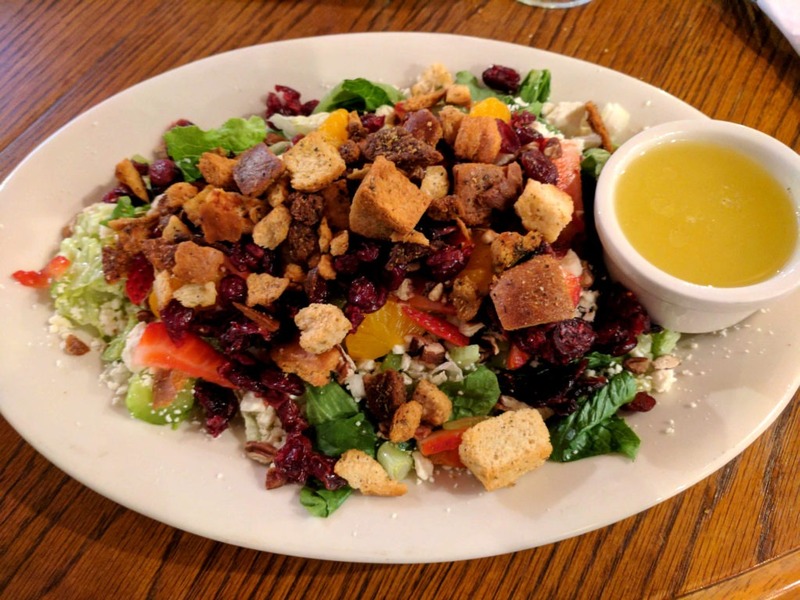 Finding gluten-free dining options in Amish Country is rare, but Olde World Bakery offers them! This is a fun place to eat with a friend, the dining room is ample and the service is quick enough to meet on a lunch break. Olde World Bakery is located in Berlin and Millersburg. I recommend their downtown Millersburg location at 73 W. Jackson Street. Hours are 8 am – 8 pm Monday- Saturday. Another long-standing staple of Amish Country is the Boyd and Wurthmann Restaurant. As you drive by in downtown Berlin, you may notice the restaurant by the line out the door! Locals have been visiting the place since it was a grocery store with a dining counter back in the 1940s, but now travelers have caught on to their affordable meals, large serving sizes, and a large variety of pies. Believe it or not, Boyd and Wurthmann will still serve you a cup of coffee for 75 cents! If your belly is too full for a meal, this is the place to sit at the counter for a piece of pie and a cup of coffee! Boyd and Wurthmann is located at 4819 East Main Street, Berlin. They are open from 5:30 am- 7:30 pm Monday – Saturday. Too tired of country-style cooking or want a craft beer? Bags Sports Pub is the place for you to eat in Amish Country! Bags is a locally-owned pub with a full bar and daily lunch and dinner specials. There are locations in both Millersburg and Sugarcreek, but I prefer the Millersburg location for its proximity to Millersburg Brewery, and it’s spot on the square overlooking the impressive courthouse! 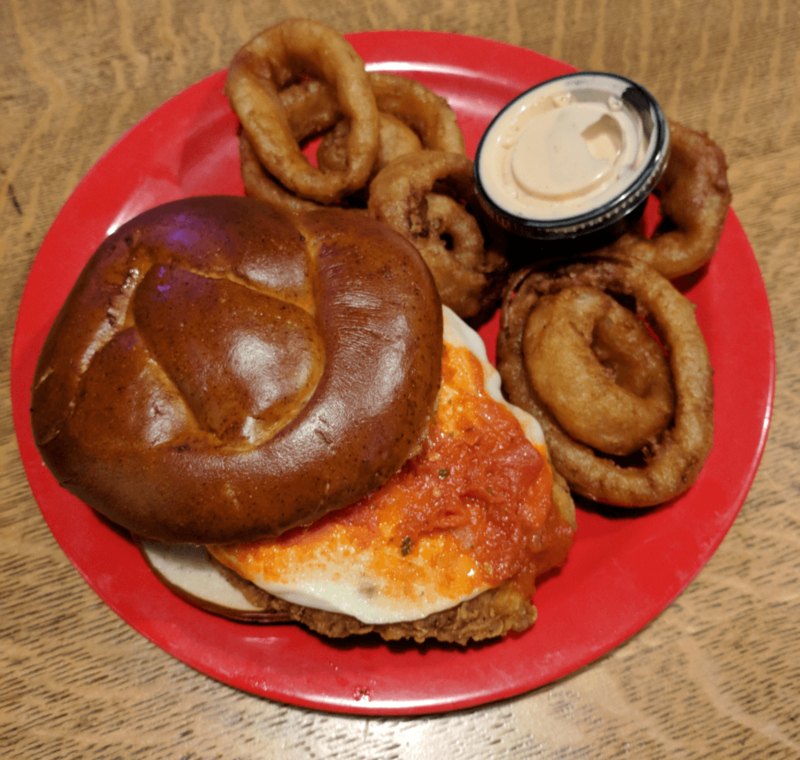 My favorite at Bags is the Chicken Parmesan Sandwich on a pretzel bun (pictured below), while my husband adores the Jalapeno Burger. Whatever you choose, make sure you try the pretzel bun AND enjoy a local brew from the Millersburg Brewery. Also, Bags IS open on Sundays! A rarity in Holmes County. Bags Sports Pub, Jackson St, Millersburg – Open Sunday – Saturday 11 am – 9 pm, Friday and Saturday 11 am- 10 pm. 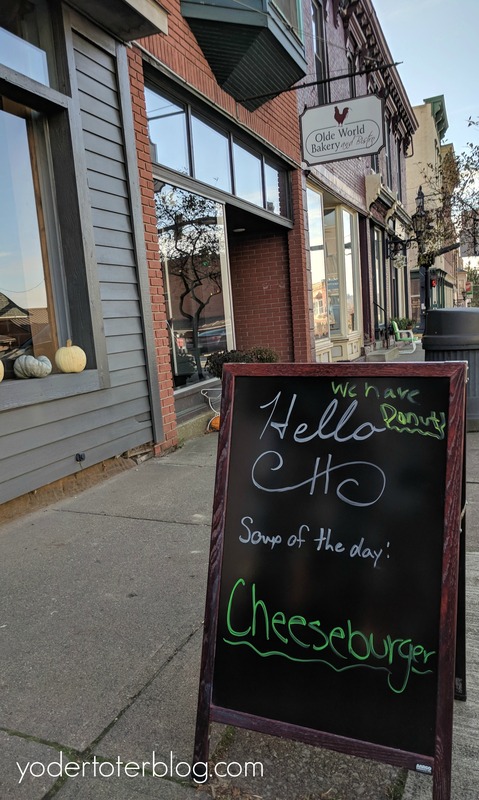 Located in Kidron, Ohio, across the road from Lehman’s Hardware; Quince is another delicious stop to add to your favorite places to eat in Amish Country. You can eat here for breakfast or lunch or pop in for a donut or cookies to take with you. There’s a daily soup special as well as different cookie and pie selections to look forward to, so no visit will be the same. Quince Bakery is located at 4776 Kidron Rd, Kidron. They are open Tuesday- Saturday from 7 am – 3 pm. This post was in partnership with Nakturnal. For me it is a toss up between Boyd and Worthmans burgers and pie or Rebecca’s savory dishes!! I’ve never had a burger at Boyd & Wurthmann- will try that next time. I need to try Boyd & Wurthman. You should! It’s a fun, old-fashioned place to eat. Kelly! No joke- The Chalet in the Valley was my first job! And when Brian came to the door to ask me on our first date, my dad yelled for me to come down the stairs and I had just gotten home, was wearing the poofy shirt and a pair of mesh shirts. So embarassing! But yes, I didn’t add it to the list because I haven’t been there since high school. We’ll have to go back and reminisce. I love the work you have done on this..It was a lot of work to visit and enjoy the area. My favorite spot is Breitenbach Winery. They have great sandwiches and awesome bar-b-que and great wines-They have a cute cafe, and in summer they have great patio dining . And they have entertainment in the summer. I haven’t checked winter. I kind of forgot about Breitenbach! We’ve done the wine tasting, but never sat down to eat. We’ll have to do that next time! 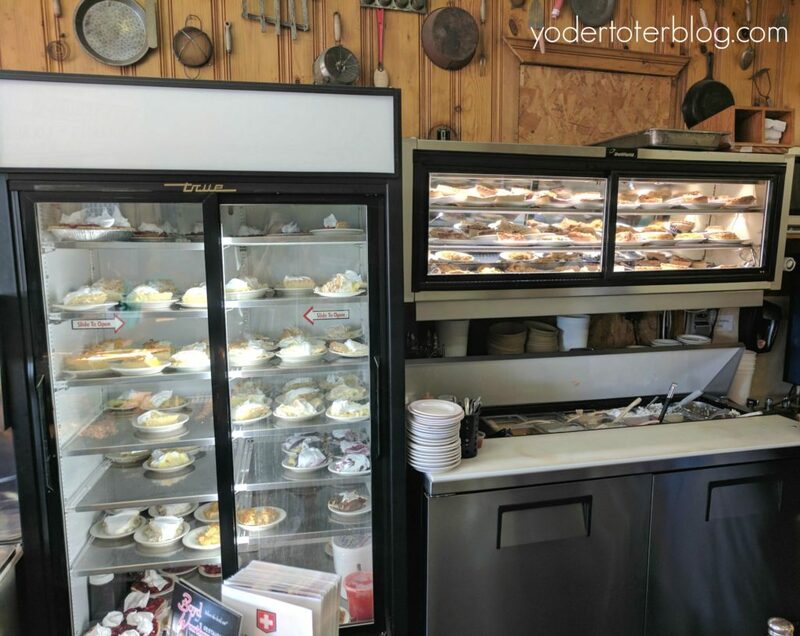 When we visit Amish Country we love eating at Mrs. Yoder’s Kitchen in Mt. Hope. We also always hit Heini’s Cheese Chalet for cheese & fudge and Kauffman’s Country Bakery for bread in Millersburg. I’m all about those cheese samples at Heini’s. Their butter cheese is amazing! I’ve got to give it to Olde World, although Rebecca’s is a close second! Der Dutchmann Peanut Butter Pie! Rebecca’s! It’s so different than other options. I love the changing menu and seasonal selections! Olde world bakery in Millersburg. We are new to Central Ohio so these are helpful reviews! Thank you! I love Rebecca’s (the amazing salads with fruit & poppyseed dressing) and Olde World Café (chicken salad on cranberry walnut bread) but also Dutch Valley in Sugarcreek where my favorite is their meatloaf! A few notes to add about Rebecca’s is that it’s a small place that’s often very busy (but worth it) and they rotate their menus weekly. This is perfect for me, because I want to visit Amish Country soon and I have NO idea where to eat! That raspbery cream pie is calling my name….as is that burger from Bags! Dee Dutchman hands down ! Best salad bar , soups , all of it ! Can’t go wrong with anything on the menu ! Boyd and Wurthmann gets my vote. Love their food and down to earth quaint atmosphere. My favorite is Rebecca’s! And old world bakerys macaroons are seriously fantastic! I grew up in Amish Country. 😉 My favorite would be a toss up between Der Dutchman or Rebeccas. They have totally different food styles, so my answer would depend on my mood when I’m asked! I do love Der Dutchman’s mashed potatoes! ! I would love to visit Amish Country, we’ve never been. I’d definitely want to head over to Walnut Creek and try Der Dutchman. I must have the broasted chicken and red raspberry cream pie, it sounds so good! That salad at Boyd and Wurthmann Restaurant looks like exactly what I would order! Chalet in the Valley is my favorite! 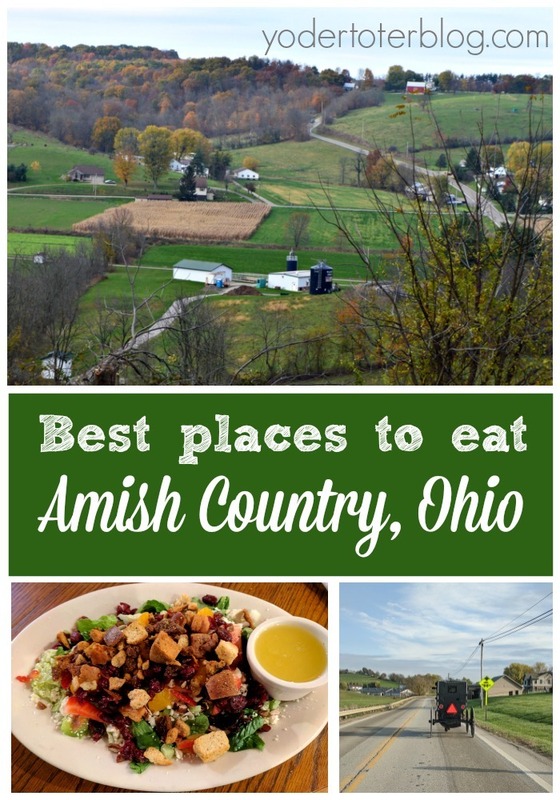 I’ve never been to Ohio’s Amish country but man, do some of those places sound good! If the restaurants are anything like Indiana’s Amish area, it is totally worth a visit!